Excite Education is in no way affiliated or connected to the government or any government agency. Federal bureau of investigation is a government agency that works on two different fronts; federal criminal investigation and counter intelligence. Working as an important agency under the U.S. Department of Justice, it has the authorization to investigate violations of more than three hundred categories of federal crimes in addition to its jurisdiction over crimes that take place on Indian Reservations in the United States. Apart from these responsibilities the FBI also plays a supportive role for other law enforcement agencies through help with laboratory examinations, finger print identification and training. Another vital aspect of the FBI operations is collecting, disseminating and analyzing intelligence information for its own use and that of its partners so as to eliminate all threats to the U.S. national security. Working as a FBI agent is a challenging yet highly rewarding career choice. You’ll be assigned an array of responsibilities that will enable the FBI and other agencies to guard US interests from internal and external threats. 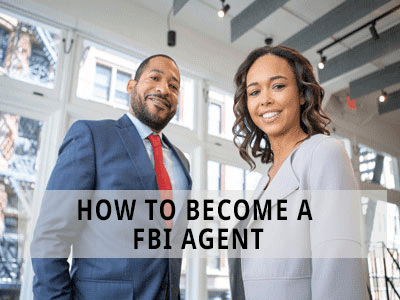 The hiring process for an FBI agent is rigorous and competitive, so you want to be prepared and have the right level of education under your belt. FBI applicants must possess a four year degree from any college or university accredited by one of the regional or national institutional associations recognized by the United States secretary of education. Any degree program that helps you develop research and analytical skills will position you well to become an FBI special agent. There are three examples of degrees that may help you become an FBI agent. They are: a law degree, which is desirable because special agents are charged with investigating violations of federal laws of the United States; an accounting degree, which may help you trace financial transactions and analyze complex accounting records in criminal investigations; and an engineering degree, which could be helpful because special agents often have to critically analyze large amounts of information in order to plan the next steps of an investigation. After earning your degree, the first step towards becoming an FBI special agent is to complete the online application. The process could take as few six months or as long as several years. The special agent selection system is based on the applicant’s competitiveness in the pool of candidates. All special agents begin their career at the FBI academy in Quantico, Virginia, for twenty weeks of intensive training. During their time at the academy, trainees live on campus and participate in a variety of training activities. Classroom hours are spent studying a wide variety of investigative subjects. The FBI academy curriculum also includes intensive training and physical fitness, defensive tactics, practical application exercises, and the use of firearms. Take the first step towards a career as an FBI agent and request more information about degree programs that suit you. What is an FBI Agent? Working as an FBI agent is a challenging yet a respectable career choice. You will be assigned an array of responsibilities that will enable the FBI and other agencies to guard U.S. interests from internal and external threats. Some of the areas that you might be working on are: cyber crime, white collar crime, financial crime, terrorism, civil rights violation, fugitive and drug trafficking, foreign counter intelligence, extortion and kidnapping, air piracy and interstate criminal activity. An FBI agent’s job can be unpredictable according to the developments of a certain case. Daily activities range from testifying in federal court to executing search warrants to gathering intelligence on illegal activities. The hiring process for an FBI special agent is rigorous, thorough and multifaceted. Candidates have to go through various application procedures and pass all other requirements for FBI agents. You can initiate the process by completing an online application form or you can apply through the FBI office that covers your residence or place of education/employment. After you have gone through the application process there are six more steps that include things like physical fitness tests, background information and medical examinations. The time frame associated with the whole process varies according to the candidates and it can range from six months up to several years. Although the FBI doesn’t encourage students to enroll in any particular degree programs or schools, there are certain fields that will help you stand out among the competition and enhance your chances of becoming an FBI special agent. Some of the fields that you can explore in this regard are Law, Accounting and Engineering. Once you are selected to work for the bureau you will receive FBI agent training in Quantico, Virginia for almost 21 weeks. At this top-of-the-line law enforcement training facility you will get extensive instruction in physical fitness, practical application exercises, defensive tactics and the use of firearms. The classroom education consists of a wide range of academic and investigative subjects. You will also get additional training over the course of your career so that you are equipped with all the latest techniques and technological developments in the field of law enforcement and intelligence. A new special agent will be appointed to one of five departments. These are: counter intelligence, intelligence, counter terrorism, criminal and cyber. A special nomination to weapons of mass destruction matters may be offered to applicants who work in counter intelligence and counter terrorism. Salaries in the FBI are according to the designated role. As per the information on the FBI's website, newly assigned agents are paid $ 43,441 (GS 10, step 1) plus locality and availability pay. Locality pay is the compensation paid to agents to factor in the difference in the labor market in different areas and this ranges from 12.5% to 28.7% of base salary depending upon office assignment. Availability pay, which is a twenty five percent increase of the combined base salary and locality pay, is provided to all agents because of the requirement to average 50 hours a week over the course of the year. Bringing all this into account new FBI special agents, depending on their location, earn in the range of $61,100 to over $69,900 a year. You should also know that the candidates are paid $1,963 (for each two week period) during the entire duration of their training program at Quantico. Furthermore, FBI agents have access to various federal benefits packages like the Federal Employees Health Benefit (FEHB), Federal Employees Group Life Insurance (FEGLI) program and Federal Employees Retirement System. Employees have time-off benefits as well and the number of leaves allowed increase with years of service. Moreover all FBI agents can attend summer picnics, holiday parties and various events which are organized by the bureau’s Recreation association. How to Become an FBI Agent in Texas? To become an FBI Agent in Texas, you should have a 4-year Bachelor’s degree. The type of degree depends on the program you are interested in. Presently, the FBI has 5 entry programs (Accounting, Language, Computer Science & Information, Law and Diversified). After completing your BS degree, you will need to gain work experience of about 3 years in a related field. You can then initiate your FBI application process and undergo training for 20 weeks at Quantico. How to Become an FBI Agent in California? To become an FBI Agent in California, you need a 4-year BS degree. The type of degree will depend on your preference for an FBI entry program. Currently there are 5 which include Accounting, Language, Law, Computer Science & Information, and Diversified. After your degree, you must gain a work experience of about 3 years in a relevant field. You can then apply to the FBI, go through the selection process and undergo a rigorous 20-week training program at Quantico. Is it hard to become an FBI agent? What degree do you need to become a fbi agent? What are the requirements to become a fbi agent? How long does it take to become a fbi agent? Q:Is there a need to pass a physical to become an FBI agent? A:A FBI agent must be physically and mentally fit to perform their daily tasks. And therefore, passing the Physical Fitness Test (PFT) is mandatory. An applicant gets three chances in a year to pass the PFT. Q:How to become a FBI agent? A:If you want to become an FBI agent you should be a U.S citizen and at least 23 years of age. Educational requirements include having a four year bachelor degree from an accredited university or college. In addition to this applicants should have three years of work experience at the minimum. Q:As i was reading about how to become fbi agent, i came across on the prerequisites. What are these? A:Some the basic selection criteria for the FBI calls for the applicants to be United States citizen or a citizen of the Northern Mariana Islands. You must be over the age of 23 years and younger than 37. You must also have a four year college degree and hold a valid drivers license. Q:How to become fbi after earning a high school diploma? A:If you are interested in becoming an FBI agent, you will need to get the right training and qualifications. Upon completion of your high school education, you can enroll in a bachelor degree program. It is recommended that you specialize in related fields such as criminal justice or homeland security. The next step would be to apply for admission in a training program. There are certain requirements you will have to fulfill to be legible for FBI training programs. Q:Do have information on how to become an fbi agent? A:To become a FBI agent, you need to be between the age of 23 and 37. These requirements are set by the Federal Bureau of Investigation. You need to have at least a bachelor level degree in a relevant field. The next step is completing an FBI training program. There are certain rules and regulations you will have to consider before applying. Q:Is it necessary to have a four year degree to become FBI agent? A:A 4 year college degree is needed to qualify for a career in the FBI. It is important to earn a degree from an accredited institute. Another requirement to be an FBI agent is to have US citizenship and a valid driver's license. Plus you need to be at least 23 years of age. Q:What qualification or degree to become FBI agent is needed? A:You must have at least a bachelor degree to pursue a career as a FBI agent. It is recommended that you specialize in a relevant field such as business administration or criminal justice. With a bachelor degree, you can enroll in a FBI training program and further acquire skills necessary for the career. Q:While searching on how many years of college to become an FBI agent, I came across educational requirements for this career. Can you tell me more about it? A:You will need to have at least a four year bachelor's degree in a related field. For instance you can have an undergraduate degree in criminal justice, law, accounting or homeland security. Make sure that the institution is accredited by an association recognized by U.S. Secretary of Education. After acquiring this degree, you will also have to complete FBI training programs. Q:While searching on how to become a FBI field agent, I came across some background check requirements. Can you explain them more fully? A:All applicants under consideration for employment with the FBI are required to undergo and pass a polygraph examination and a test for illegal drugs. FBI will also investigate about your credit and records checks. Your former employers, colleagues, friends, neighbors, friends and instructors will also be interviewed to ensure that you are morally and ethically eligible for employment with FBI. Q:My search on how to become a FBI officer mentioned training programs conducted by FBI. Can you tell me more about them? A:Selected applicants are required to undergo training at FBI Academy. They will learn about practices in stress management, defensive tactics, physical fitness and other practical application exercises. Other focus areas include electronic evidence gathering, terrorism management and intelligence analysis. They are also given training in the operation of modern and traditional weapons. Q:How do you become an FBI agent? A:You need to go through various application procedures and clear other requirements to be an FBI special agent. Some of the basic FBI qualifications are that you must be a U.S. citizen. Your age should be between 23 to 37 years when you are appointed as a special agent. You also need to have a four year college degree from an accredited institute, have a valid driver's license, and must be willing to be posted anywhere according to FBI's authority. Q:Is it hard to become an FBI agent? A:Becoming an FBI agent is challenging but is also equally rewarding. The hiring process is rigorous, thorough, and multifaceted. Candidates have to complete a number of application procedures and meet all requirements for FBI special agent careers. Citizenship, age, college degree, and driving license requirements are to be met by applicants. Q:What degree do you need to become a fbi agent? A:To join the Federal Bureau of Investigations, you must have a bachelor degree. There is no educational program designed specifically for FBI careers. However, to qualify for training in this field, at least a bachelor degree will be required. Areas recommended for studies are: accounting and finance, business administration, information technology, security, and more. Q:What are the requirements to become a fbi agent? A:To become an FBI special agent, you must be over the age of 21 and must have a US Citizenship. Apart from this, you must have a four-year degree from an accredited college. Although there is no specific degree program designed for FBI agent careers, it is recommended that you pursue subjects such as business, law, information technology, or finance. Upon completing all the minimum requirements, you may qualify for FBI agent training programs at the Bureau. Q:What do fbi agent do? A:FBI special agents are required to investigate different cases related to the violation of national security and federal law. The tasks may vary from case to case. General duties include: investigating terrorism and corruption crimes, enforcing law, collecting and analyzing evidence, and more. FBI agents are highly trained professionals who have gone through rigorous training for this career. Q:Why become a fbi agent? A:FBI special agents enforce criminal laws and help protect the nation from threats. This field can be challenging in many ways, but also brings a sense of achievement and satisfaction. FBI agents work for the FBI, and are provided compensation in different ways. FBI agents also receive retirement benefits, insurance, training, and paid vacations. Q:How long does it take to become a fbi agent?